Whilst Hossein Amini’s directorial debut feature is stylish and chic, this adaptation of Patricia Highsmith’s novel (The Talented Mr Ripley) feels uneven and uninteresting. Starring Viggo Mortensen, Kirsten Dunst and Oscar Isaac, The Two Faces of January, is a downbeat thriller that follows a con artist, Rydal (Isaac) who meets a wealthy, bourgeoisie American couple, Colette and Chester MacFarland (Mortensen and Dunst) on holiday in Greece. In the first moments of the film, the audience are forced to become wary of the mysterious and playful Rydal, he stares a little too hard at people around him and quite clearly is always making plans in his head to fleece those naive tourists around him out of their money. The MacFarland’s seem like a down to earth, intelligent couple – happily married and happy to be away together; they are exploring Athens at a time when it was rare for people to travel around the world and they are taking advantage of everything about them including when they meet the young Rydal who seems happy to help. Whilst at first the story appears to be about Rydal and what he could possibly do the couple but things quickly turn on their heads when it is revealed that Chester is part of a scheme just as devious as anything Rydal could have thought out – he has stolen huge amounts of money from his clients in America and that is how he is able to travel around Europe so freely with his wife. This is one of the biggest strengths of the story and of the film, it has taken audience expect ion and subverted the story to something else. One evening after dinner out with Rydal, the MacFarland’s return to their room and are confronted by a private detective who has come to get money for one of those people that Chester had stolen from. He confronts the couple, despite Colette knowing nothing. Whilst Chester tries to get the detective to come to the bar with him to chat this through, he doesn’t budge and instead their conversation become violent and he ends up killing the detective. It is Rydal that is caught in this web of conspiracy and lies set up by Chester, who is a better con artist than Rydal; he helps Chester move the body to another bedroom and eventually helps them escape Athens for the islands. He also arranges for fake passports to be delivered for the couple so that they can fly back to the USA. Soon it becomes clear that the only reason he is helping is because he has feelings for Colette, who may feel something similar back for him. Chester become jealous, angry and drunk, which leaves the couple in dire straits and constantly arguing. Then starts a chase against time and the clock, who is going to get out of Greece alive and free? On paper, a charming and delicately structured thriller but unfortunately Amini’s adaptation just seems a little heavy handed. The character exposition is pretty average and the audience have no reason to care for any of the characters whatsoever. Even the chemistry between the three feels forced at the best of time; whilst Dunst and Isaac are comfortable around each other, the sparring married couple feels stagy and pointless. As mentioned, the film is beautiful; the locations and the clothes are glamourous and sparkly with wonderful colours matching each other. 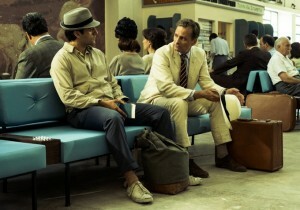 The palate of the film is delicate on the eye, matching the whites, yellows and beiges in the clothes with the world that the characters find themselves. The locations in Greece and Turkey are stunning on screen, whilst Amini’s eyes isn’t too hot on story or character, he laps up the landscape as good as any other director, so much so that they become part and parcel of the story itself and as important a character. Even in the last act of the film with a constant supply of twists and turns, it doesn’t seem enough to excite the audience. Whilst The Talented Mr Ripley back in 1999 was chic and thrilling, showcasing hot, young talent and keeping the audience on the edge of their seats throughout, The Two Faces of January just feels uninspired and dull.